In the landscape on Naxos Island there are three giant marble sculptures, which are incomplete statues of young men, probably intended to be on a temple roof. Length is from about 6 – 10 metres. They are to be found close to the marble quarry where the marble was mined. The statues dates from the 8th to 6th century B.C. Friday I desided to visit two of the sculptures: Kouros of Melanes and Kouros of Potamia (in the picture). It’s a nice area to go by scooter, little traffic and a lovely green landscape! The first statue is laying in a fertile valley, an olive grove. It’s a very peaceful place. 10-15 years ago I remember that it was possible to have a coffee in the adjacent garden, Paradise Garden, during the main season. 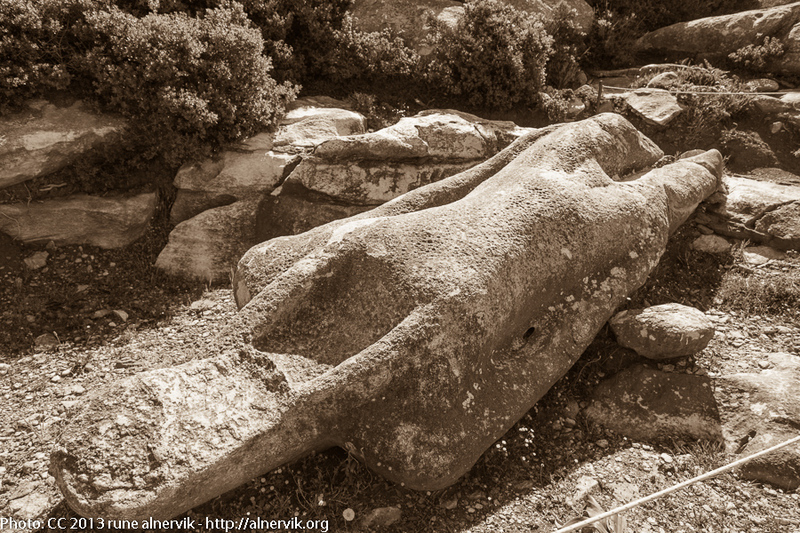 To find the second, Kouros of Potamia, you have to go uphill a few hundred metres. From there it is a nice view of the valley below. This entry was posted in Kultur, Landskap, Natur, Resor and tagged Historia, Kouros, Naxos on 2013/05/13 by Rune.